Day 31 Of The Great Release Challenge — Happy New Year! Congratulations! You Are a Winner! Happy New Year! 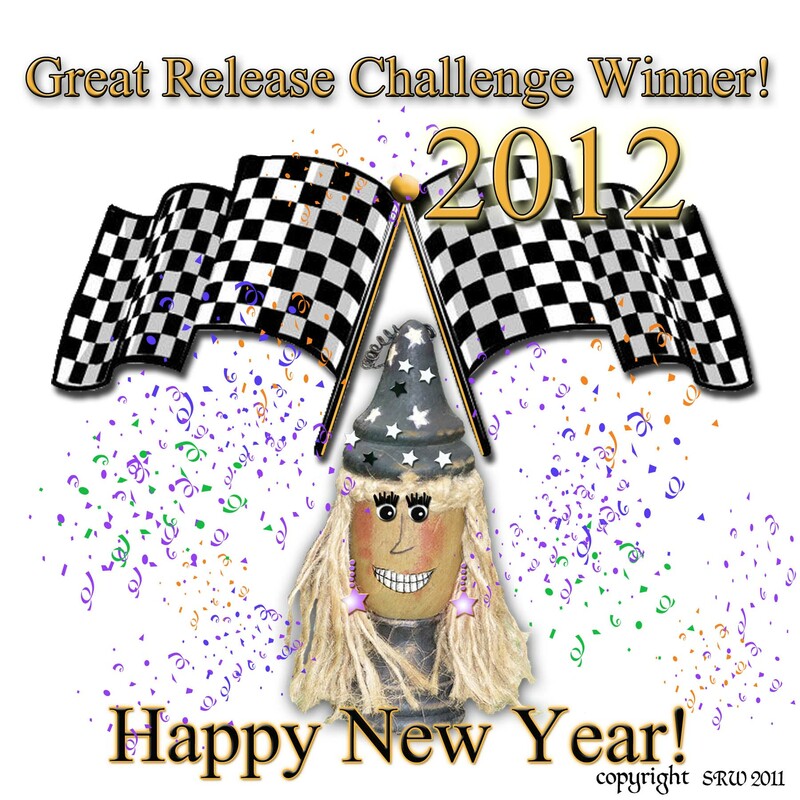 Day 31 — 2011 Release Program — You’re The Winner! Congratulations! If you completed yesterday’s challenge you made it through the program! I’m so proud of you! It has truly been a marvelous joy working with you this year and I have treasured our time together. We’ve all had our ups and downs these past thirty days. As a team we made it through, supporting each other, doing magick together, and sharing our experiences. The group mind is a marvelous thing! 1. Use plastic sleeve baseball card holders in a notebook. For larger coupons, use plastic photo sleeves. Both will fit in a ring binder. Decorate the ring binder with magickal sigils to promote positive abundance and good fortune. 2. Organize your binder by expiration date followed by product type. This way you won’t miss out using a coupon because its expired, and expired coupons you didn’t use can be easily and quickly thrown away. 3. Keep some coupons with the product currently in use. For example, I have a large clear glass jar for dog bones. And, of course, we always run out of dog bones right before, or right after I’ve gone shopping. Last year, I started putting the coupons for the dog bones right in the glass jar with the dog bones. That way, when I see we’re running low on the treats, I just pull out a coupon and put it in my wallet or attach it to my weekly grocery list, depending on when I plan to go to the store next. 4 Keep the unusual, specialty coupons or gift certificates in your wallet, particularly those from specialty stores. For example, let’s say you get a rewards coupon from your favorite craft store. Yet, every time you’re out doing errands, you forget to use the coupon because you neatly filed it away…somewhere. Tuck this kind of coupon in a back pocket of your wallet or purse so that you have it with you the next time you visit that store. Today’s Challenge: Ritually welcome in the New Year by building a sacred spot in your home that reflects your wishes and desires for the coming year. Light one white candle at the stroke of midnight, and every night thereafter for seven days. Intone our daily prayers and our manifestation conjuration as your ritual; or, write something special that reflects your personal desires and choice of deity energy. End your ritual by using our Gold Star Meditation. You can simply become one, super nova glowing star, or take the time to make them all shine! At the end of your ritual, be sure to make a declaration of conclusion (So Mote It Be, So Be It, etc.) and remember to seal the working. The New Year holiday is one of my favorite because the energy created by human celebration as it thunders and rolls across the globe offers you a tremendous boost only attainable once a year. This year the First Quarter Moon is in Aries — an aggressive, starting energy that will last only for a short time — specifically until Monday, when at 5:16 PM (2:16 PM PST) when the Moon enters Taurus. Aries is best known for its burst of energy. A great starter; but, not a long term finisher. An Aries Moon is great for things you want to start and finish quickly — small goals that you believe are easily attained by your own hard work or forward momentum. A great energy time for recharging your personal power batteries, so that you can roll positively through the next few weeks. Larger goals begun under an Aries Moon should have a back-up plan that includes Taurus (the next sign) energy, as Taurus is often considered the most stable sign of the zodiac and can help solidify those long-term plans. 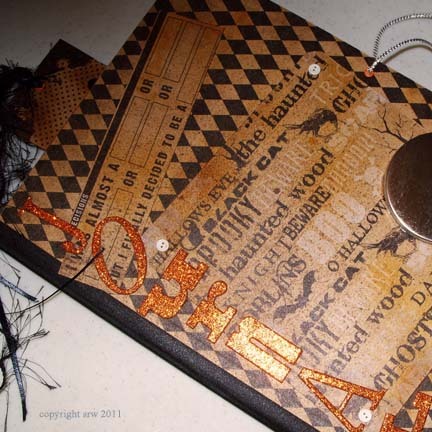 These items can be employed in the spellcasting process, or given as gifts to Deity, the beloved dead (if they liked the items), or Good Spirits. If you complete today’s challenge of a New Year’s Ritual and creating a sacred spot that will reflect your wishes and desires for 2012 –you earn the last gold star of the program — Congratulations! For Tomorrow: My most sincerest blessings to you tomorrow, and every day thereafter. Merry Part until we Merry Meet Again. Hettie and I will miss you. 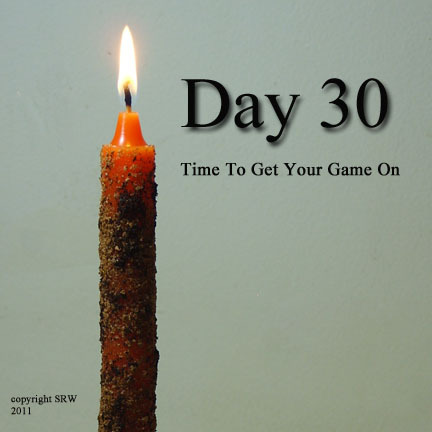 Day 30! The Volcano Cauldron Candle Spell! We’re Gonna Finish With A Bang! Are You Ready for Today's Mega Challenge? Just today and tomorrow…and then we have successfully finished the Great Release Program for 2011. How cool is that! Today its time to think of positive abundance. It is so time to get your game on! First, let’s make a list of what good things you want to work toward for 2012. Choose a few small goals, some medium ones, and at least one large goal you want to invents your time in. Write them down, and be as specific as possible with room for Spirit to choose something better for you if necessary. For example: “I want a brand new metallic pink ATV with snow shovel attachment or better.” Or, “I want my environment to be a place of peace and happiness, filled with family joy or better.” Or, “I want to increase my psychic abilities or better.” The “or better” part allows that-which-you-believe-in to find what’s best for you. If you don’t want to add the “or better” — hey, that’s okay, too. The most important aspect of making your list is that a) You Believe (Know) having these wishes granted is possible; and, (b) You are willing to work toward the attainment of them. Something you have certainly shown with all your effort in the Great Release Program this year. To kick off my wishes today, I created a new journal for 2012. I’m going to place my wish cards in there after I finish today’s challenge. I'm Ready for the New Year! Journal? Done! Before I forget it — let’s look at Hettie’s Tip for Today: Use a chair as a table. Hettie’s tip is really — think outside of the proverbial box. Be imaginative! The picture below shows a chair used as a table. 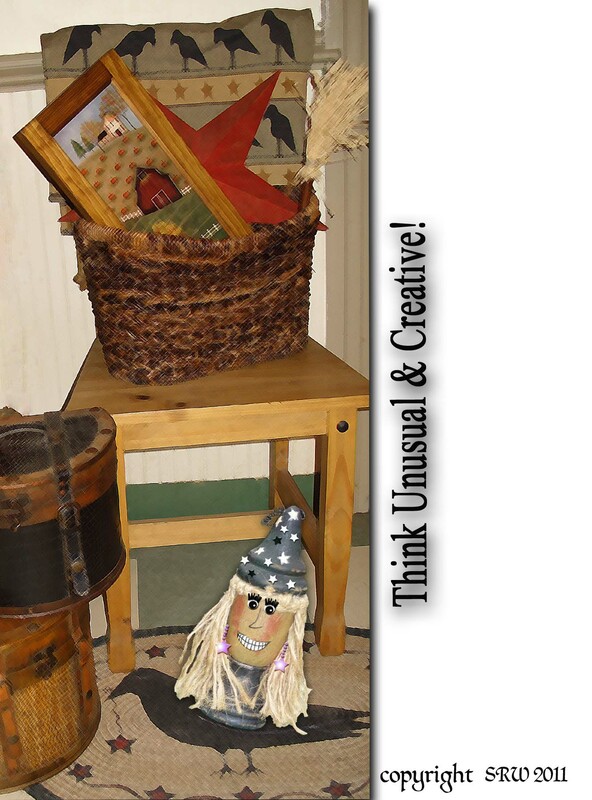 The basket holds favorite decorative pieces. Who says I have to hang them on the wall? They look great just the way they are. Change-up with the seasons to make your decor more interesting. Always remember that what you choose in decoration and its placement greatly affects your emotional environment. Use a Chair as a Table -- Think Unique in Your Decor! Today’s Mega Challenge is a fun one — its a super spell that I’ve never published. Before we begin, you’ll notice that I have at least two optional ingredients. You don’t need these for the spell to work. This little enchantment is called The Volcano Cauldron Spell and is designed to literally help you get moving, get what you want, get it fast, and of course…get your game on! At least one taper or votive candle (red, orange, or yellow — white if you don’t have these). * Your candles can come from the dollar store, they needn’t be expensive. I used 6″ tapers in the example pictures. Appropriate sized candle holders AND fire safe surroundings. IMPORTANT NOTE: Due to the herbal additions to this formula your burning candle should be monitored at ALL times. Herbal ingredients have a tendency to pyro super fast. When using either taper or votive, I suggest placing the candle in a fire safe pot or cauldron. Remember that fire is a hazard to life and property. 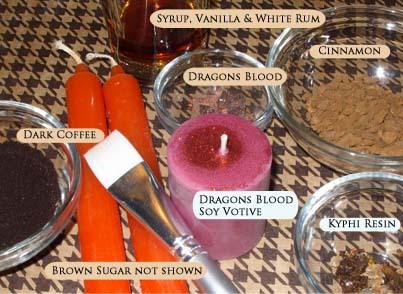 Create and use these candles at your own risk. The taper candle will burn within an hour. 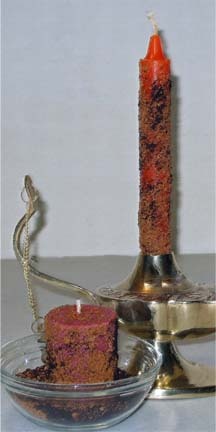 The votive candle will burn much longer if placed in a holder that I will show you later on in the article. You will also need at least one of your goal cards that I discussed at the beginning of this article. Step One: Gather all your supplies. Cleanse them with sacred smoke or perfume if you like, then bless and empower them. Step Three: In a clean bowl, combine the ingredients in Step Two with the Brown Sugar and Dark Coffee. Set aside. Step Four: In clean cup, combine Syrup, Vanilla Extract and White Rum. Remember, since we are dealing with fire, use only one drop of the rum. Stir in a clockwise direction 21 times. Sprinkle the dry ingredients onto the white paper. Step Five: Put your white paper or wax paper on a smooth surface. Sprinkle the dry mixture directly onto the paper. With the paint brush, lightly coat the taper candle with the wet blend from Step Four. Do not paint the wick or the very top of the candle — only the barrel. If you are using a votive, coat only the sides of the votive with the wet blend, not the top. We use a paint brush to keep the mess to a minimum and provide an even coating on the barrel of the candle. Although lovely and lumpy, more is not necessarily better on your coating. And, yes, this is exactly how grungy candles are made. The final step for that (which we are not doing here) is to dip the candle into a double boiler of wax melted to the manufacturer’s specifications. 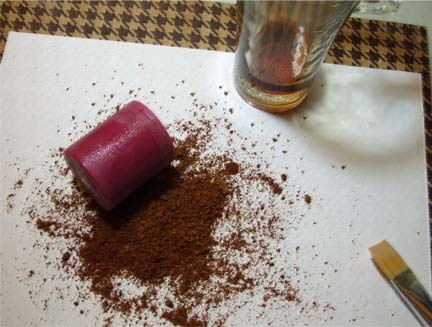 Roll the taper candle toward you to coat with dry mixture. Coated votive about to be rolled in dry mixture. As An Aside: A long time ago I learned that when making herbal candles (either from scratch or as in this spell) you always keep the herbals off the wick pool area of the candle. I also learned that more is not better. 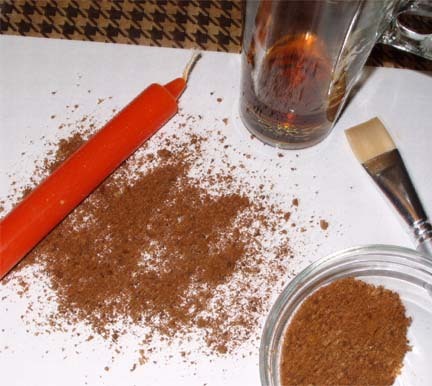 Finely ground powders pack as much punch as gobs of herbs and are far safer for the practitioner. A candle completely covered with heavy herbals will torch like the Fourth of July. Trust me on this one. They don’t call me the powder keg witch for nothin’. “From nothing to something I will this thing to form (you can replace the word “thing” with what the candle is for). Keep repeating the charm until you are finished coating the barrel. Set the coated candle on the other clean white piece of paper. 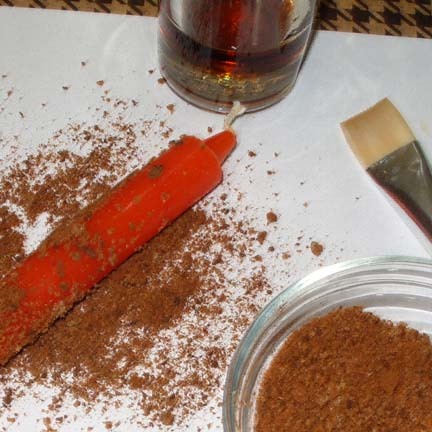 You can roll just one candle and save the remainder of the mixture for later, or you can roll several candles and store the ones you don’t use in a plastic bag. Step Seven: You are now ready to empower the candle one last time — hold the candle with fingers of both hands in line with your heart chakra. Repeat the above manifestation spell nine (9) times. Finish with “I know it will be done!” stressing the word “know”. Place candle in appropriate candle holder. In the pictures shown below, the votive candle is placed in a fire safe bowl, and then dropped into a larger glass goblet. 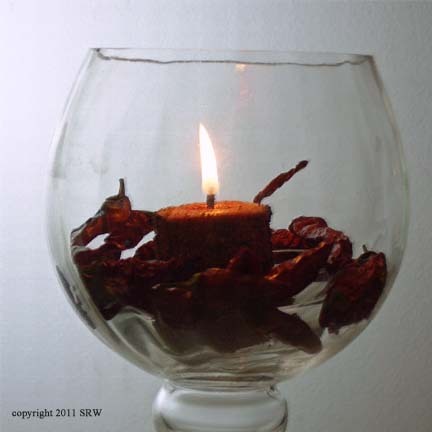 The hot peppers are ringed on the outside of the candle holder; but, in the goblet itself, making an eye catching centerpiece. Finally, 1/4 cup of empowered water was placed in the goblet (but not the candle holder). I chose a soy candle that I poured myself for this example. This is a soy pillar blend that will hold its shape to a point, eventually however, it will collapse. That’s why I picked a small, fire safe bowl as its container. The wick on this candle is strong enough to hold a nice flame even though I’m using a bowl slightly larger in diameter of the candle (to catch the puddle wax). The amount of wax as it melts in this example is enough to keep the votive from torching like the taper might do. Votive Volcano Candle -- For a Safe Burn, remember to keep the wick pool area (top of candle) free from herbals. 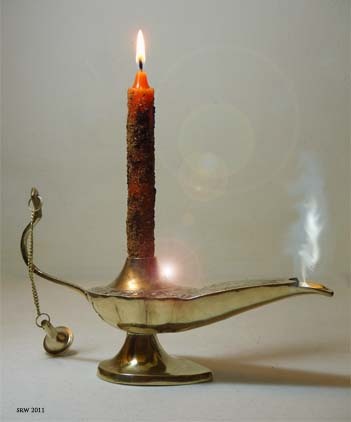 In the second example, I’m using a traditional wish lamp made of brass. Although you can’t see it, inside the lamp are the hot peppers and a small amount of blessed water. In the picture the lamp is shown standing alone; but, for the spellwork I placed the lamp in a fire safe container because the taper candle was sure to flare up — and it did. Although this looks very attractive, due to the herbals the entire lamp was placed in a large fire safe cauldron. I'm glad I did -- the candle burned hard, strong, and fast! If you don’t want to use whole hot peppers, you can add hot pepper powder purchased at your grocery store at Step Three above. Step Eight: Place your wish card under the candle holder. You may now choose to cast a circle, or simply call sacred space. You might like to use your Morning Daily Prayer as a beginning to this ritual, or you may simply like to utter a prayer, or play music, or drum…your choice. Your request for divine intervention and to whom you make that request is also your choice. Light the candle and one last time, repeat the Manifestation Spell nine (9) times while holding your hands toward the candle flame (not too close). Strongly visualize a picture in your mind of what it will look like and feel like to receive your desire. Close your eyes if it helps, them open them and look up and to the left as if you are staring out at your desire and watching it come toward you. Thank deity, and close circle if you cast one. Step Nine: Clean up. Of course! This is the Great Release Program, so we definitely can’t leave a mess. When you candle has finished burning, take your wish card and place it in your journal or Book of Shadows. You can also take your wish paper outside and burn it in a cauldron, or bury the paper in the ground on your property. All render equally effective results. If you complete today’s challenge of creating the Volcano Cauldron Candle– you earn another gold star! This is number Thirty! Wow! This star stands for …yup…Action! Place it anywhere on your aura during today’s meditation. Busy day here! I finished another wall in my office/craft room. Took more stuff out of that basement (I’ll get ‘er cleaned, yet). Made and photographed the Volcano Cauldron Candles, created my 2011 Journal, had dinner with my daughter and granddaughter, and visited with my oldest daughter for a spell. And you thought that was just an archaic turn of phrase, didn’t you?